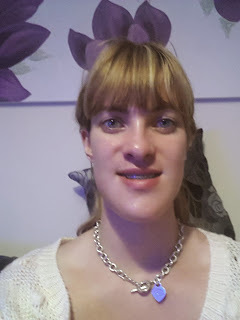 So 1 week ago I was very scared and apprehensive because it was the day of my operation! And a week on I have absolutely no regrets. Yes the recovery is hard, and it's long, frustrating and boring but so was the bit before it. All the adjustments and cut up lips and cheeks, sore teeth, sore and achey jaws. The whole damn thing is long! But, the reward at the end of all this is fabulous, and I can see one massive reward all ready. I have teeth that are the right way round. I can get a good look in my mouth now, and my teeth look brilliant, I'm so pleased. Food wise, still on the liquid. My meals generally consist of a fortisip or a complan shake for breakfast, soup for lunch and dinner and a shake of some sort for snacks. I'm sort of drinking coffee, but it's not the same through a syringe. The syringes are driving me mad! I cant manage a straw yet, just haven't got enough suction/ mobility in my lips and mouth yet. Roll on Friday for my visit with Mr O to get my wafer out. My dad took me to the doctors today to hand in my discharge note, and just over the road from the doctors is a nice little boating lake, so we went for a walk round there. It was nice to be out and getting some fresh air, even if we were lapped by a yummy mummy and some OAP's power walking! My mouth is still getting really dry, it happens about 7/8pm and then talking becomes really difficult and hard work because i cant move my lips, they feel stuck almost. It feels like a mixture of having too much peanut butter in your mouth and being really parched, desperate for water after a hard workout. Horrible is the word to describe it. Will speak to Mr O about it on Friday. Another lazy day today really. Just mooched about the house with my dad most of the morning. I was having another good look in my mouth this morning and I found my stitches. They aren't that bad really. I thought it would look really gross all bloody and crusty and bits of mouth up in there and that I would feel sick and feint when I saw them. But surprise surprise it wasn't as bad as I thought it would be! They are just nice neat little stitches, they look like little bits of cotton in my mouth. I can see the one at the top under my top lip and the one they used to do my chin in my bottom lip. I think they are dissolve ones because Mr O hasn't mentioned taking them out. In the Afternoon I went to my mum and dads for a change of scenery, and I had to pack myself up a little bag of things i would need. I felt like i was about to leave the house with a baby. I put wet wipes in for those inevitable spills and drools, 4 syringes, 2 bottles of food aka fortisip drinks, some liquid ibuprofen, vaseline, and tissues. It was nice being out of my house and to see my parents dogs again, they were good with me and didn't knock me, which was a miracle, they are so clumsy and stupid, must be in the St Bernard breed. I wouldn't want either of them coming to rescue me up a mountain, they'd get distracted and forget! In the evening My mum and dad took me to a group that I volunteer at called PHAB, they had sent me a get well card while i was in hospital so I wanted to say thank you. I didn't go for a month before my operation, I had so much on at work, it was just too much to do. so it was amazing to see them all again. I felt so lucky to be part of such an amazing group of people, so kind and caring and I really realised just how much i missed them all. I got all emotional when I left. I was only there for half an hour but it tired me out quite a bit. I am going to try and sleep on my side tonight, I cant sleep on my back any more, I've had enough. I'm going to create some sort of head and neck support with pillows but leave my face. I'll try anyway! I managed to sleep on my side! It took me ages but i got it right in the end. Lots of tossing and moving around various shapes and sizes of pillows but I got there. I didn't sleep right through the night but much better than before. I went so see my Ortho today to have my wafer removed! Yay! It was a brilliant appointment. Mr O was pleased with how my teeth were looking, he wanted to take some pictures of my wafer in as it was a special kind of one that had been created for me and he wanted to use it and my mouth as an example for his students. I'm always happy to help others learn so agreed for the pictures to be taken. It was a bit more painful than i had first anticipated. He had to use the cheek retractor things but it is very difficult to get them in when you cat open your mouth and your cheek/mouth movement is limited. The plastic was pushing against an incision point on my top gums and that hurt, but it was only for a minute or two so it was bearable. Once the pictures were done Mr O took my stitches out on the side of my face. they were tiny little things. I was really scared about that, thought it would hurt, but i didn't feel a thing, came out so easy. the first one i didn't even no he had done it! Then came to wafer removal! first he un banded me, then un banded my wafer and asked me to relax my jaw and let it drop a bit. Now what a strange and exciting feeling that was. I opened a bit, then a bit more, and a bit more. It didn't hurt, it was a tint bit achey but to be honest the excitement of opening my mouth was all I could focus on. Then we took some more sore pictures with the wafer in but not attached, then the big removal was ready! He asked me to open my mouth and I did, bit by bit. Not bit by bit because I was stiff or anything but more because I didn't know how wide I was opening my mouth. It felt like a lot but it wasn't. Anyway then Mr O just pulled the wafer out and there we go. No wafer! He let me sit up and rinse my mouth out. Then he said I was free for 5 mins. So I just kept opening and closing my mouth. It was the most strangest and brilliant feeling in the world. My teeth touched, all of them, my back teeth I really noticed. Then I went to say " Oh my god Dad this is so weird" but got to "Oh my go..." when I realised that my mouth was different, the way i move my mouth was different and the words didn't sound right, the syllables and the way i annunciated was different, all wrong. It was so odd. I tried again and it came out, but it still felt strange. I just kept talking and saying my teeth touch, my teeth touch, then i started crying, my dad started welling up, the dental nurse too. It was honestly such an amazing experience and feeling. Something that so many take for granted, but that I and many others have waited to experience for so long. Then I had to relinquish my freedom and be banded up again. Mr O said to come back next Thursday, where he will change my bands again and this time I will be able to take them off to eat mushy food! Yaaaaaaaaaaaaaaaaaaaaaaaaaaaaaay!!!!!! I am so excited to be able to eat mush! He also said I should find it easier to use a straw now, so hopefully I can say bye to syringes soon enough. Oh and I told him about my dry mouth and he said it was strange, never had anyone complain of a dry mouth before. My mouth looked healthy and clean, so just keep an eye on it and let him know how i get on and my next appointment. The hospital gave me the fortisip and shakes when i left, i didn't have to pay for it. 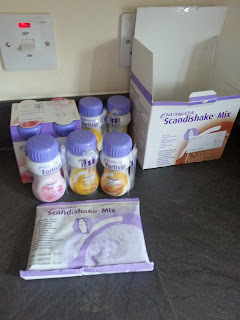 They gave me enough for a couple weeks, but I was missing 2 boxes of shakes as they gave me banana flavour fortisip and scandi shake and i don't like banana, it makes my tongue itch! So I think they generally give you 3 weeks worth. I also bought some complan sachets, they were about £3-£4 for 4, it was just something slightly different to eat. I found the strawberry ones nice to add honey and yoghurt too. How are you feeling about your surgery? Thanks for your reply, sorry only just seen it. The hospital i'm going to don't sound like they give you anything foodwise, but I'll just wait and see and can just buy some (more like get someone else to buy some) if they don't.